Because I live in a place without real seasons, buy everything is a little bit backward here. Our growing months are actually November through April, sildenafil so unlike the rest of the country, I haven’t gotten a CSA box in a long time. When I was getting my weekly box of produce, I would often have an overwhelming number of loose beets. Now don’t get me wrong, I actually love beets. In cooler months, I like to roast them with other root vegetables. They turn slightly sweet and work really well with parsnips, rutabaga and potatoes. In warmer months, I like them sliced paper-thin and tossed with salad greens, toasted nuts and blue cheese. But no matter how many different dishes you make, there always seem to be more beets in your box than you can use in a week. This pasta is a really good way to get rid of those extras. The beets are simmered in beef stock until they’re tender and slightly sweet. The gorgonzola adds richness and flavor, while the pancetta lends just the right amount of salty pork flavor. 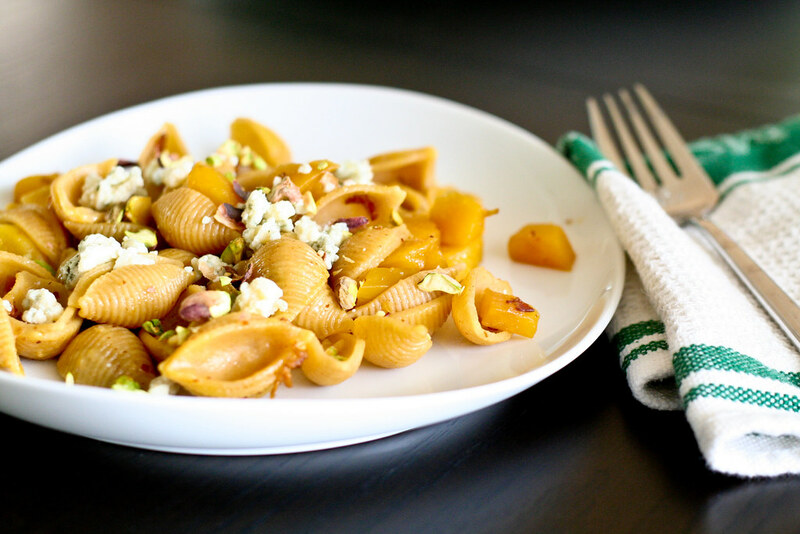 Chopped pistachios are sprinkled on top for a little texture and crunch. It’s a simple dish that’s full of flavor and a great way to put those extra beets to good use. Even if you’re not that into beets, I promise you’ll love this dish. If you’re family’s not that into beets, just don’t tell them what’s in it until after they’ve taken a bite or two and started to make “mmmm” sounds. They’ll be asking for more beets in no time. Prep your ingredients by dicing the pancetta into small pieces and thoroughly washing the beets with a brush. Peel the beets, then cut them into a rough 1/2-inch dice. Set a large skillet or wok over medium heat and cook the pancetta until it begins to turn golden, about 5 minutes. Remove the pancetta with a slotted spoon and set aside. Add the beets and beef stock to the pan and let simmer for about 20 minutes, or until the beets are fork-tender. While the beets are simmering, cook your pasta. Reserve 1/2 a cup of the pasta water before you drain. If your skillet is big enough, toss the pasta in with the beets. Otherwise, put the pasta back in its pot and scrape the contents of the skillet over it. Add the pasta water, olive oil and cheese and toss until well-combined. 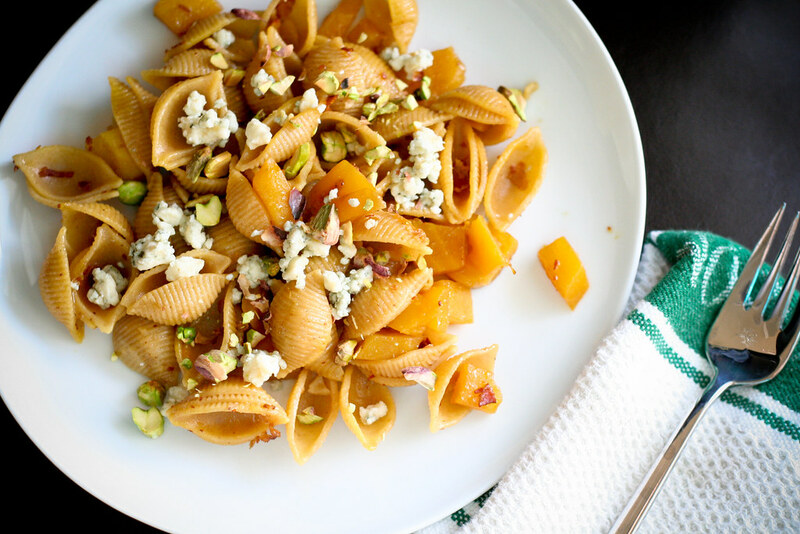 Serve and sprinkle with pistachios. I love beets, although I am having trouble finding the golden beets. They are just so beautiful I am dying to try cooking with them! I just finished eating this dish, and WOW it was terrific!! It was very easy and fast, too. I had never had golden beets; thanks for introducing me to them. I’ll definitely make this again. I cooked the beet greens according to a recipe from America’s Test Kitchen. Trim and wash the greens, blanch for two minutes, drain and dry, saute with shallots in olive oil and butter with shallots. Kelly – Thanks! Glad you liked it :) Your recipe for beet greens sounds awesome!